Bangalore-based Radhika Nichlani married Melbourne-based Vikas Parashuram. Says Radhika: …Im a Sindhi, and Vikas is from Karnataka‚and ours was a traditional South Indian wedding. 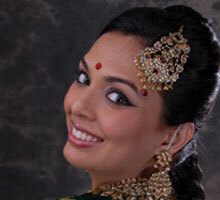 For most of the functions, Radhika wore creations designed by her family members. …My sister designed and embroidered some of the outfits, and my aunt created the cholis. All her jewellery had a glittering past- antique and temple-inspired yellow gold creations. The functions included a Mehndi, Muhurtam (morning wedding) on 20th April, a Reception and Cocktail Party. Adds Radhika: …I was lucky as my good friend Shreya is a wedding photographer, and she took some amazing getting-ready and candid shots at the wedding I was also really pleased with Wedding Planners Krafted Knots who co-ordinated the Cocktail Party. For the Mehndi at Manipal County in Hosur Road, Radhika wore a very colorful outfit. She explains: …Since I was wearing traditional sarees for the other functions, I wanted to experiment with colors for the Mehndi. I bought the fabric for this ensemble (red blouse, yellow dupatta and blue lehenga) from Mysore Saree Udyog in Bangalore. My sister Aarti Nichlani (she runs the boutique Taxxi and Vitamin K in Bandra, Mumbai), added the gold embroideries and border to the blue lehengas, and embellished the dupattas with ghungroos and pearls. The red blouse had my favorite peacock motifs on it. For the morning wedding, as per the wedding traditions (Gowda community) Radhika had to wear a white Kanjeevaram. She says: …Since I was wearing a Kanjeevaram for the post-wedding function, I chose a white Benarasi silk for the wedding, which I bought at Folds, the boutique at Commercial Street in Bangalore. She teamed it with a beautifully embroidered white blouse and pure gold set from Shri Krishna Jewellers. 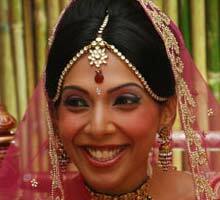 For the reception Radhika wore a rich, red Kanjeevaram which she purchased from Samyakk a boutique in Bangalore. 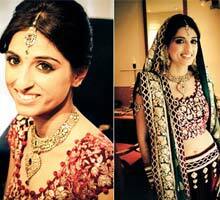 Her make-up for all the functions was done by Sabrina, a Bangalore-based make-up artist.